Tilghman Island is nestled in the heart of Talbot County, Maryland. Formerly referred to as the “Great Choptank Island,” the island is only 3 miles long (4.83 kms) and a 1 mile (1.60 kms) wide. According to historians, the first English settlers arrived over 360 years ago in 1656. During the early 19th century, two parcels of land were sold to a group of oysterman. The group wanted the land for its close proximity to the prime harvesting grounds that surround Tilghman Island. Today, over 1,000 thousand residents live on the island. A majority of the residence make their living by crabbing, fishing, and oyster or seafood packing. Throughout the its recent history, severe thunderstorms and eroding waterways have caused sediment, clay, mud, silt, sand, and shells to build up, blocking the Knapps Narrows access channel to the Choptank River. Consequently, the Knapps not only shortens the route around the end of the island by over five miles (8kms), it is the home port for dozens of fishing and crabbing vessels. In some locations, depths have been reported as low as a 1 foot (0.30m) during low tide. 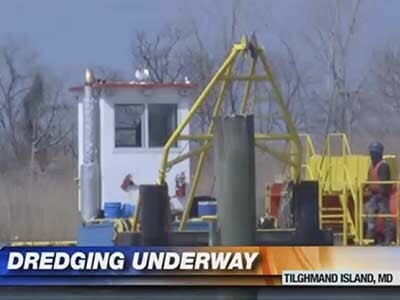 The blocked channel is preventing Tilghman Island businesses from thriving. Several business owners have lost nearly 50 percent of their business. Ron Cicero, the owner of Tilghman Island Marina and Rentals, said that the impact has been felt by everyone. “Restaurants and tourism on the island have declined dramatically over the years.” Cicero also added that boaters and tourists are staying away from the island because of the blocked channel. With so many declining businesses struggling to survive the local economy has suffered. As a result, residents took matters into their own hands, and started searching for answers to their problems several months ago. Residence can now breathe a sigh of relief. The US Army Corp of Engineers in conjunction with various branches of the Federal Government, Maryland State Government, Fish and Wildlife Service, and the Talbot County government have agreed to allow crews to dredge approximately 100,000 cubic yd3 (914,40 m3) of material. Workers are using an Ellicott Series 970 Dragon Dredge to clear the channel. The Hydraulic dredge is ideal for this specific job. To summarize things, the dredeges’ cutterhead will remove the debris found in the river. The dredge will then pump the discharge efficiently to a distant location. In fact, we are already a week into dredging, and crews have dropped a blue pipeline on the west side of the Choptank River. Now the dredges are sucking up dirt and water – pumping it out of the river to a nearby farm. The project is expected to cost approximately $1.4 million and will be done by Memorial Day weekend.